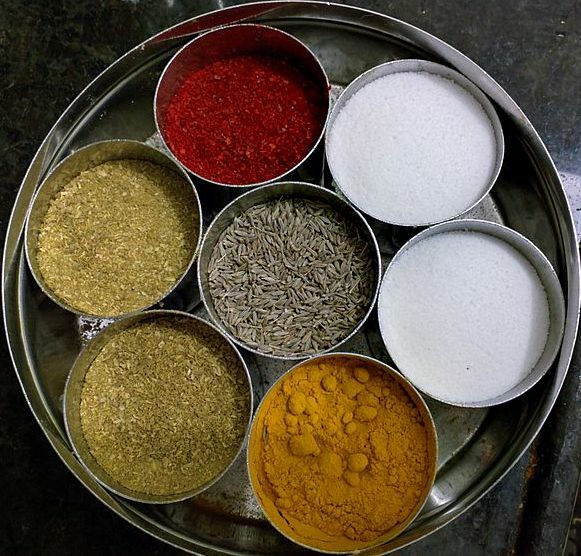 Spices are very important part of Indian food. Without the spices Indian food is incomplete. Some of the popular spices used in Indian food are- Asafetida (Hing), Black Pepper (Kali Mirchi), Celery (Ajmud), Cinnamon (Dalchini), Cloves (Loung), Corriander Powder (Dhania Powder), Fennel Seed (Saunf), Fenugreek Seed (Methi Seed), Brown Mustard Seed (Rai), Poppy Seed (Khus Khus)etc. Spices can be used in different forms depending upon the need. Sometimes green spices (Green chile, Ginger, Corriander Leaves) are used, sometimes their seeds (coriander seeds, mustard seeds) or the roasted version of it are also used. Some spices are nothing but the mixture of different spices. Such as garam masala. It is nothing but the mixture of several spices. We can make different type of garam masala by mixing different spices in different ratio. Today we use a large variety of spices. But in the beginning in Indus valley civilization we were not aware of the spices. We started using spices in the vedic age. Some of the spices used in Indian food is borrowed from the people of other countries. Like sugar. The use of sugar is learnt by Indians from the protugese. Spices are not only good for improving the taste of food but some of the spices have medicinal value also. Turmeric is a natural antiseptic, Cumin helps in asthma, Ginger helps in digestion, Cardamom helps in bad breadth, Clove is very useful for tooth and gum, Black Pepper is used to treat cough and fever. Indian Institute of spices research is located in Kozhikode, Kerala. Its main purpose is to research different Indian spices.